The UK's contribution to tackling the Ebola crisis will be examined at a conference in South Lanarkshire later. Military personnel, aid workers and medics will attend the event in East Kilbride hosted by the Department for International Development. It will highlight the work of charities and volunteers who have worked to combat the virus across West Africa. 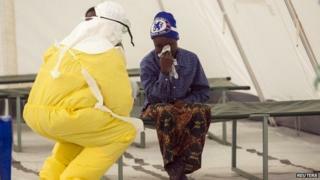 More than 10,000 people have died across Liberia, Guinea and Sierra Leone since the outbreak began last year. Figures from the World Health Organisation also show that there have been more than 24,000 reported cases. More than 50 Scottish health workers have volunteered and around 300 military medics have been sent to West Africa to help those affected by the virus. The conference will hear from Scottish Secretary Alistair Carmichael, International Development Minister Baroness Northover and Alasdair Kerr, a staff nurse at Glasgow Royal Infirmary who has recently returned from Sierra Leone. There will also be a live link to people currently working in Sierra Leone. No British nationals have died from the virus but nurses Pauline Cafferkey and Will Pooley both needed critical care for the highly-contagious disease after contracting it while treating patients in Sierra Leone last year. A female military healthcare worker is currently being treated for Ebola and was flown back to the UK last week after she tested positive for the virus. The woman is being treated in a high-level isolation unit at the Royal Free Hospital (RFH) in London after being flown back to the UK on Thursday from Sierra Leone in a RAF plane.